Getting closer, to the Bahamas, and warm, in a relative sort of way. It’s Tuesday morning and Brenda and I are on our way south in a rental car, headed to Ft Pierce and Pandora. As I begin this post we are tooling along 95 south and have just entered Georgia. The last few months have been an emotional whirlwind as my father’s health declined and we dealt with things that we had (thankfully) precious little experience with. A very important step in all of this was to find a good place for my mother Shirley to move to and after several weeks of exploration, I found her a very nice apartment in an assisted living facility in East Haven CT. Happily, the place is not too far from some of her friends of many years, which was important. As an added bonus, her apartment, located on the third floor, has a commanding view of Long Island Sound, a piece of water that I have passed through so many times over the last 40 years of sailing. So, one week ago we moved her from her apartment of nearly eight years to a nice new place. Happily, my mother paid me the ultimate compliment a few days after she moved in when she told me that she liked her apartment and that I had chosen well. Yahoo!!! What more could a son ask for. She’s the greatest. When I told her that I was planning to abandon her to head out for three months in the Bahamas she thrilled me again by taking my hand and saying that after all of my hard work that I deserved to take a long trip. Well, that made my little doggy day. We’ll see how she feels about me ditching her after a few months. Ditching her Bob? Well, that’s exactly how I feel. I will say, in defense of myself, that the place is just lovely and with a lot of help from Brenda, her apartment is very well decorated . Thank you Brenda!!! That’s not the first time I have uttered those words. Yes, indeed, thank you Brenda. So, after leaving New England, and single digit temperatures, far behind, we are now in the deep south passing wetlands that so remind us of our trip south on the Intra-Coastal Waterway, the ICW, one year ago. 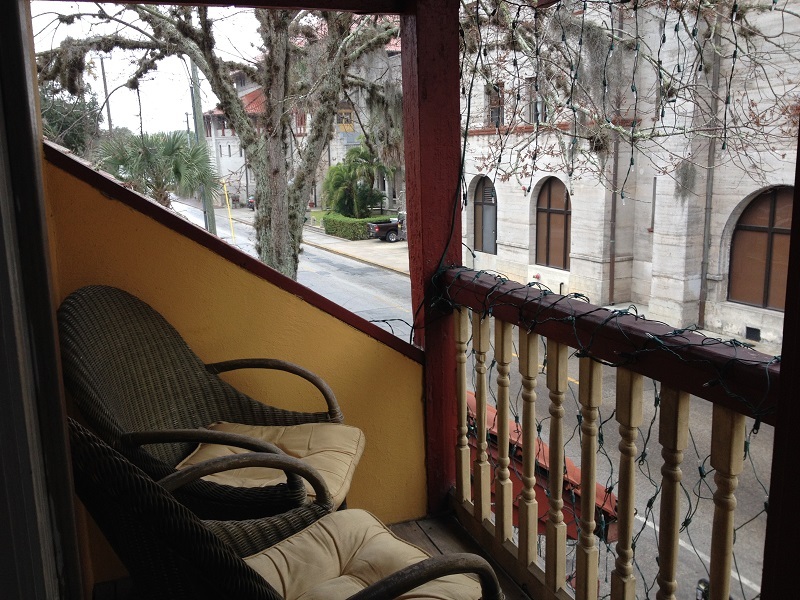 One of our favorite destinations on that trip was St Augustine and we plan to stay in a lovely historic inn, The Old City House Inn, downtown in the historic district, for the next two nights before finishing our journey to Ft Pierce and Pandora later this week. 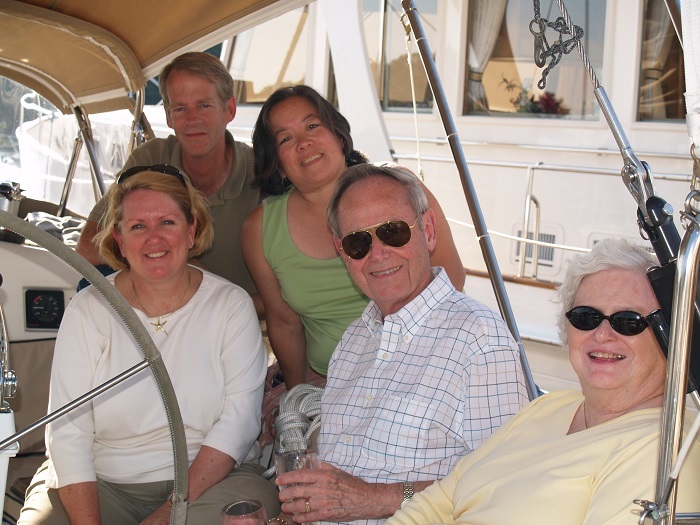 Today we will have lunch with our friend Peter who recently sold his SAGA 43 after settling as a snowbird in St Augustine with his wife where they live for the winter and summers in Maine. A few years ago they too were passing through St Augustine on their way south aboard Lumen, their SAGA and they loved the city so much they decided to buy a land home and settle here as their winter home. Peter collects classic cars in a big way. Peter and his business partner own about two dozen cars. That’s a lot of cars. They have a website www.mainelineexotics.com. Peter told me that his site is currently being updated but should be ready in just a few days. I’d check back as he owns some really exotic cars. Peter’s collection is clearly in a different league than ours. However, Brenda and I do own a single classic. 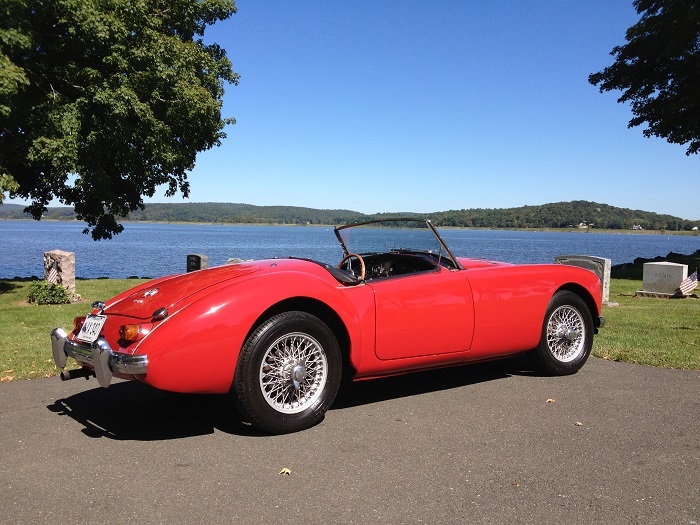 A nice little, fully restored, red 1962 MGA Mk 11, one of the last of the MGAs built. Big collection or not, owning even a single classic is just terrific. Not a bad way to spend time enjoying New England summers when we aren’t out sailing in exotic places. This is a view of our little car near our “summer home” in a beautiful cemetery overlooking the CT River. That’s as opposed to our “winter home”, Pandora. Not much use for a convertible car in New England in the winter so that makes it a good time to head south in my book. The last two days of driving south have been interesting, in boring sort of way, as we passed over mile after mile of highway, watching the late January landscape go from winter grey to the first pink buds of spring. Yes, here in GA the buds on the branches are starting to swell in anticipation of warmer weather. I can’t say that I have ever used the words “spring” and “January” in a single sentence. I guess there’s a first time for everything. My brother Bill has been driving this route for years as he delivered show horses to and from FL and the winter show circuit. He too has marveled at the changes in temperature or seasons on his way back and forth, sometimes three times a week. He told me that one year he drove to FL and back thirty times. Yikes. He also mentioned that on one visit as he headed south, it was snowing hard as the light faded one evening and as the sun rose the next morning he was driving among palm trees. Now, that’s a fast season change in just eight hours. Speaking of Bill, as we headed south on Monday, just outside of Richmond VA, I called Bill and found that he was headed north in the same general area. So, we talked on the phone for a short time, just long enough to wave to him as he raced past us going north as we headed south. How amazing to actually see him pass us as we went by in the opposite direction. Who’d expect to see pass a single particular truck on a 1,000 journey. Well, it seemed pretty neat to me and Brenda. Well, it’s now Wednesday morning and we are in St. Augustine. Nope, I didn’t get my post done on the same day. I’ll blame it on Internet trouble. It’s fun to visit friends along our travels and we met our friend Peter yesterday for lunch after arriving here in St. Augustine. It was a treat as we only see him on occasion as we move up and down the East Coast. These periodic visits with friends are very much a part of cruising aboard Pandora as acquaintances enter and leave our lives only to re-enter again, year after year. Over the last few weeks the number of e-mails from friends like these have increased with questions about or plans and timing for crossing over to the Bahamas. Just last week I spoke to Ted and Ginnie aboard Firecracker, another SAGA 43, when they were getting ready to head further south in anticipation for crossing to the Bahamas. Yesterday I tried them again and the phone went immediately to voice mail, a sure sign that they are out of cell range and probably on their way to the Bahamas or already there. As an interesting aside, Ted’s boat is called Firecracker as he was born on the 4th of July. It must be nice to have everyone shoot off fireworks on your birthday. For those who have seen my blog over the last few years, you have seen reference to my “spot” GPS transponder that marks our location on a Google Earth map so our friends know where we are most any time. I have even gotten “spot messages” from a few folks recently who want us to keep track of their travels too. It’s fun to stay in touch with this “movable neighborhood”. Great fun indeed. Note that on my home page, there’s a “where’s Pandora” button. 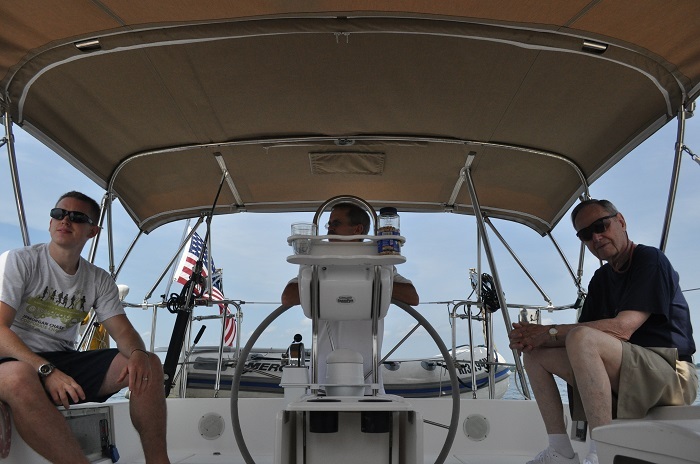 When we are aboard, and we will be there soon, you can click on the link and see where we are. I think that’s pretty neat. We will make a point of “pushing the button” each day and more often that that when we are underway. Oh, I should note that our room here is really quite cute. Happily, Brenda approves too. The inn is above a pretty little restaurant. There’s only seven rooms. Very quaint. Each room is very different and ours has a tiny balcony overlooking the street. Nice view. The only problem with the weather is that the ice storm that we were racing to avoid is now a rain storm here. It’s in the low 40s and rainy. Not perfect Florida weather. However, it is January and warmer in a relative sort of way as the temps at home in CT are a somewhat less balmy low teens. Yes, it’s getting warmer but only sorta so. Well, it will be better soon as the weekend is expected to be in the 80s. That’s good and just what I am looking for. Speaking of boating and just for fun, here’s a short piece of a less than delicate way to bring a ship up to the shore. It seems that this ship, after years of work on the English Channel, was to be scrapped in Turkey. So…what better way to get her up on dry land than to drive her full speed and crash up onto the beach. Not to subtle but efficient in a crash and bang sort of way. Do not try this at home. Here’s another way to interest Brenda in sailing, uh…boating. I think. My family often jokes that my life for the last 35+ years with Brenda has been a series of desperate moves designed to help her enjoy her time aboard as much as I do. So, do I think that this is a fair assessment? Yes indeed, I have done pretty well except for the times, which might possibly have been too frequent, when she hasn’t enjoyed it. It’s those not so fun times that our oldest son Rob refers to as “career limiting moves” (CLMs). Examples of CLMs include.. a day spent thrashing to windward. CLM. Nights spent at anchor with no wind and temperatures in the high 80s or worse. CLM. Day after day of rain and nothing to do. Well, you get the picture. The good news is that after so many years of cruising with me, Brenda continues to spend months every year aboard. That’s very good. I guess that means that the good times outweigh the CLMs. Good. So, with that in mind, what am I planning as my next set of “desperate moves”? Yes, that’s the burning question for me as we prepare to return to Florida and Pandora in a few week for our second visit to the Bahamas. I do find self thinking “what next?”. Will we go for a third season in the Bahamas next winter or branch out for something new? We do enjoy the Bahamas very much. What’s not to like about warm temperatures and chrystal clear water? Yes, it’s pretty nice. However, I know that Brenda really wants to visit places that have great architecture, art and restaurants. The Bahamas have some of that but that’s not what they are known for. Here’s an idea… Brenda majored in the classics. Latin and Greek. So, where can we go with Pandora where there’s lots of that sort of thing. Yes, you guessed it. Europe, across the “Pond”. Also, she I know that enjoys river cruising and our trip down the ICW last year was very enjoyable. So, recently I mentioned the idea of taking Pandora on a canal tour from the English Channel all the way to the Med. She loved the idea. How cool is that? So, I decided to do some preliminary research. I found that there are some 5,000 miles of canals in France, most of which are deep enough to float Pandora, and the operative word is “most”. This map shows just how extensive they are. The dark blue colored canals are plenty deep to float Pandora, the lighter blue ones, just barely, I think. I have contacted an expert on the subject and he seems to think that we can plow our way through the shallow parts and not get stuck. This map shows just how extensive the network is. Pretty amazing. I am told that the part of the trip that is in central France will be the most challenging for our draft. I guess we’d enter in Rouen and exit in Petit Rhone. 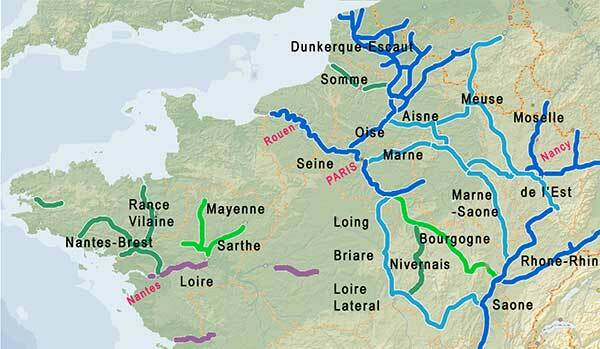 For now, I am keeping my fingers crossed regarding the “skinny water” in central France. Besides, I don’t want to go fast anyway. Too much to see along the way. The site, www.french-waterways.com is a great source of information on the canals and the moderator/editor, Grehan, has been very responsive to my questions. It is his opinion that with my 1.8m draft I should be able to push my way through the low spots and do fine everywhere else. I guess I will need more information on that score but it’s an encouraging start. I found this interesting video on the site. It’s a first hand overview of what it’s like to go through a lock in France. It’s amazing just how narrow the locks are. Many of the locks are only 14′ wide and Pandora,with her 12′ beam will fit with about one foot on each side. I tried to find other videos that showed the countryside but didn’t find quite what I was looking for. I’ll continue to explore to find some worth sharing. For now… Brenda finds it amusing and sometimes alarming that when I get an idea into my head…I do it. When the boys were young, they had all sorts of ideas and plans of things that they were going to do and Brenda’s approach was to just smile, nod and wait for them to forget and move onto something else. She says that I remind her of a ferret that we once had as a pet years ago named Ricki. Well, when Ricki got something in his mind (and it was a small mind), it was impossible to change his direction. You could pick him up and turn him around time after time and the same thing would happen…he’d just turn around and head to the same place, again, again and again. I guess that’s why Pandora is named Pandora. Brenda was very clear that when we acquired a boat that could cross oceans. Well… I’d want to cross oceans. So, now it’s up to me to come up with cruising ideas that include places that Brenda finds compelling. Canal cruising in France? Pretty compelling to a girl that loves the classics. And, I am counting on that. That’s all for now. I guess I have more research to do. Wish me luck. Eight years. An era comes to a close and renews again. On Sunday morning December 29th my father, Bob Sr. passed away. He had been sick for nearly a year but did quite well and was able to continue with a fairly normal life in spite of developing leukemia. Happily, he was able to be active up until a few weeks before the end and for that I am grateful. 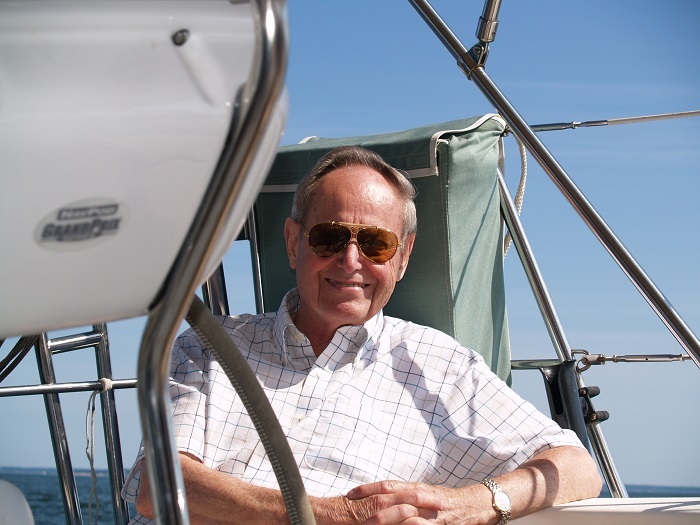 While this is first a sailing blog, I feel compelled to mention my father’s passing as it was for him and my mother, that I first decided to begin writing this blog over eight years ago. It’s safe to say that it was with my dad in mind, that I “penned” very single post and kept up with it at times when ideas for posts just wouldn’t come. If it wasn’t for the simple question of “what would Dad be interested in reading?” I doubt that I would have continued. Dad was a tireless fan of my blog and each time I sat down to write, it was for him that I put down my thoughts. That’s not to say that my mother wasn’t an important motivation to me as well, but it was Dad that sat down in the evening, called up my site, poured a glass of wine for him and my mother and proceeded to read my posts out loud as they enjoyed an evening cocktail. It was exact image that was in my head as I wrote every post and chose every photo or video. Every step of the way I pushed the button on my “Spot” GPS transponder, so that they would know where we were and it was always a great treat to call him on the phone to check in as we moved from harbor to harbor and have him say something like, “Wow, you are making great progress” as he viewed Pandora’s location on Google Earth. In spite of the fact that I spent countless hours with him over the last year as his health slowly deteriorated it didn’t make it any less hard to handle the finality of his passing. However, I take comfort in knowing that this blog, in a small way, is a legacy to him and the unique pleasure he took in “living vicariously” through my words and pictures. As I look back on the last eight years and over 350 posts, it makes me happy to know that these “conversations with Dad” will live on long after he’s gone. Dad was only aboard Pandora a few times but I am thrilled to recall these days as perhaps some of my fondest. I recall the first time both he and my mom were aboard shortly after we took delivery of Pandora. While we kept her on a mooring in Norwalk CT, I was able to find a slip to pull into so that we could bring my Mom’s wheelchair down the ramp to the boat and help her aboard. With the help of my friend Chris (the same marine artist guy that I wrote about in a recent post) we were able to get her aboard and headed out for a terrific afternoon sail. This shot pretty much sums it up. A great day. 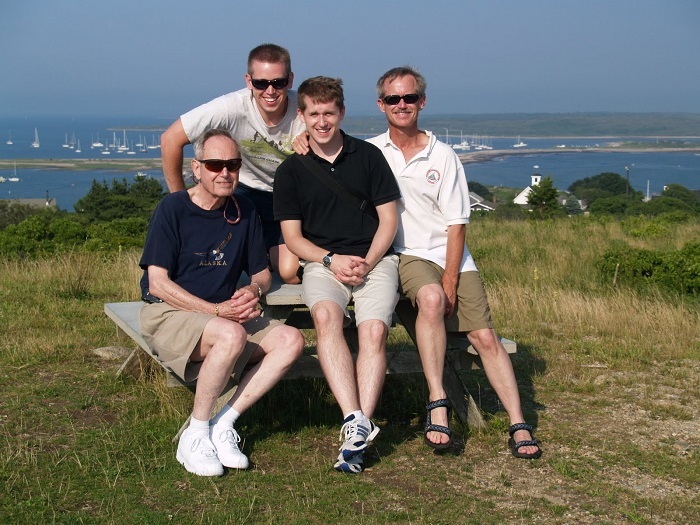 Another time Dad came out with me and our boys when we took a run from Wickford RI to Cuttyhunk and on to New Bedford a number of years back. It was a picture perfect weekend with bright sunny days and dense fog at sunset to complete the mood. 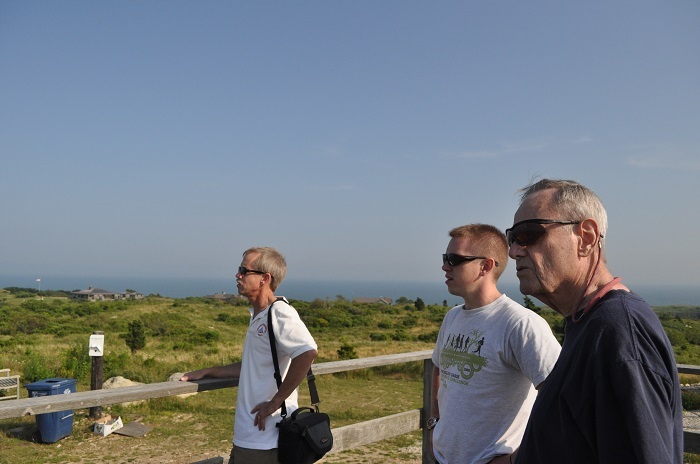 We hiked up to the top of the hill on Cuttyhunk to enjoy the overlook facing up Buzzard’s Bay. A passer by agreed to document the moment for us. Three generations of Osborn men out having a “guy’s weekend”. I recall that later that afternoon, as we sat on a mooring in the harbor, the fog rolled in. Dad, who had not spent much time on the water, was entranced by the sight of the sun setting behind the fog. After Cuttyhunk we motored up Buzzard’s Bay to Fairhaven MA, across the harbor from New Bedford and picked up a mooring owned by fellow Corinthian Patty Jason. We enjoyed a cocktail on her patio overlooking historic New Bedford Harbor, the perfect end to a weekend with dad. My dad was only aboard Pandora a few times but through my blog and the thousands of miles and hundreds of posts, he’s been aboard every step of the way. For me, he will continue to be there as we continue or travels aboard Pandora and I will imagine him pulling up my posts on the screen while he enjoys a glass of wine thinking about me and Brenda and what we are up to. I’ll will miss him terribly but knowing that, as I write this and future posts, he’s looking down and smiling makes me feel better. That’s a good thing and, in many ways, the continuation of an era. With that in mind, I guess I’ll keep writing. I guess that the smile on his face says it all. Yes, he approves, of that I am certain.